Amazing Detoxes that Have Been Designed to Sculpt a New, Heathier, Fitter, Smarter Version of YOU! Due to the ever increasing advancements in the modern world & our hectic lifestyles, our bodies are constantly under attack from nasty toxins and free radicals. These chemicals are proven to have harmful effects on our bodies. And are one of the major causes attributed to 80 to 90% of all cancers. Even the healthiest of us, could benefit from a detox plan every once in a while. So the guys at Detox Pro are a team of expert dieticians that have designed a range of detailed healthy diets. Presented in a structured and easy to follow manner. 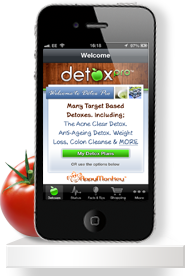 Helping take the stress away from the planning, tracking and managing of your entire detox.